Is it lazy of me to still see traces of The Dark Knight trilogy in Arrow’s storytelling playbook? We’re five seasons in at this point. Isn’t it fair to say that Arrow is kind of its own thing at this point? Spoiler Alert from 2005: The man Bruce Wayne believed to be his friend and mentor was secretly the villain hiding in plain sight. In Christopher Nolan’s version of things, Liam Neeson’s Henri Ducard, a honest-to-goodness, easily Googled real comic book character, was actually Ra’s al Ghul the entire time, a brilliant twist on both general audience and comic book reading fan’s expectations. Now, on Arrow we come to discover Prometheus is actually DA Adrian Chase, who has always seemed a tad unhinged but threw us (and Team Arrow) off the scent by doing upstanding things like sticking his neck out to clear Diggle’s name. We had been led to believe Chase’s extra bit of “there’s something not right with him” intensity was because he was secretly Vigilante. The show made this connection by often cross cutting between the two. Plus, in the comics Adrian Chase really is Vigilante (just as Ducard really was just some guy named Ducard before Nolan made him Ra’s al Ghul). To be fair, there are only so many ways you can introduce villains in a superhero context. Arrow has done the “he’s actually my best friend’s dad/old friend I thought I killed!” surprise reveals along with the more standard “oh, hello Ra’s al Ghul/Damien Darhk. Nice to meet you. We fight now.” Now, the writers have played the Batman Begins card and played on our Wiki-comic book knowledge. The fact that they did it in the same episode in which Oliver allowed the city to think Green Arrow is a villain, recalling Dark Knight’s “he’s the hero we deserve, but not the one we need right now” ending, only compounded the Nolanisms throughout. But pulling from the Nolan superhero handbook is not a sin nor is it reason to dismiss “Fighting Fire with Fire.” A well-executed twist is a well-executed twist, regardless of whether or not it vaguely recalls old superhero movies. So, really, was this well-executed? I have to give it to them: I didn’t actually see it coming. That’s mostly because I haven’t given Adrian Chase a second’s thought all season and was just patiently waiting for the inevitable Arrow-Vigilante fight to happen to allow that Punisher clone in a Snake Eyes-wannabe costume to finally go away. However, to have Prometheus literally throw Vigilante off a building, and then turn around to reveal his face was a nice gotcha moment, although I gather others saw this coming a while ago. What happens now? 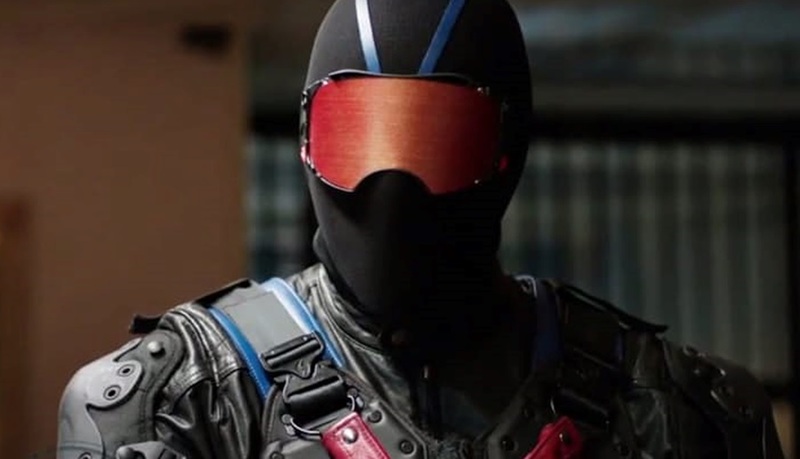 And if not Adrian Chase who the heck is under that Vigilante ski mask? We’ve always striven to have the villain be the hero of their own story and to get underneath the reasons why they are what they are and do what they do. Adrian Chase is no exception. What’s interesting for us is how close those parallels are with Oliver’s own story. We wanted to build a villain that’s a dark mirror for Oliver, and honoring Oliver’s past on the show, especially the first season. Seeing what it was like going through the loss. They’ve both suffered losses and they’ve both answered those losses in very different ways. Now I separate the block quotes just to make it easier on your eyes. We really wanted to build him up as someone who is extremely good at being 10 steps ahead of Oliver, really being psychological in the way that he manipulates him. One of the ways he does that is by going after the people that Oliver cares about. We’ve seen villains do that in the past, but this year Adrian does it in a way that’s a little bit more specific. His goal is very clear: he really has no drive to kill Oliver. It’s purely based on torture. It’s all part and parcel of this drive to break Oliver down psychologically as opposed to physically. As for the rest of the episode, it oddly felt like a repeat of last week’s episode (shame on you, Thea, so sayeth Oliver) while also oddly treading similar territory as this week’s Flash (a hero always finds another way). I actually found it quite galling to see Oliver harping on Susan Williams so much, not because I root against those two but that it seemed absurd to begin a sentence talking about his pending impeachment and end it with his worries over patching things up with his girlfriend (both Thea and Felicity hilariously called him on this). But the episode was designed to cement Oliver’s season 5 (or at least recent season 5) status as hero, sticking to high-minded ideals about how to use the office of mayor and multi-tasking if he must to restore Susan’s good name because it’s the right thing to do. Perhaps it’s my own post-Trump cynicism about politics seeping in, but I found myself resisting “Fighting Fire with Fire”‘s Capresque view of politics, siding more with Thea than Oliver because she seemed to be the only one willing to face the facts that he was about to be impeached. The fact that his little gambit (i.e., offering up the Green Arrow as public sacrifice) actually worked and prevented his impeachment is another example of Oliver’s personal growth as a hero and leader through his role mayor trumping actual plausibility this season. After all, he should have been impeached. He wildly abused the powers of his office! On to top of that, his explanation should have made things worse. He openly admitted to knowing the city had another serial killer on the loose, yet he kept that information from the cops thus putting more lives at risk. But it’s the Arrowverse. Stop expecting things to make sense. Just sit back and enjoy. 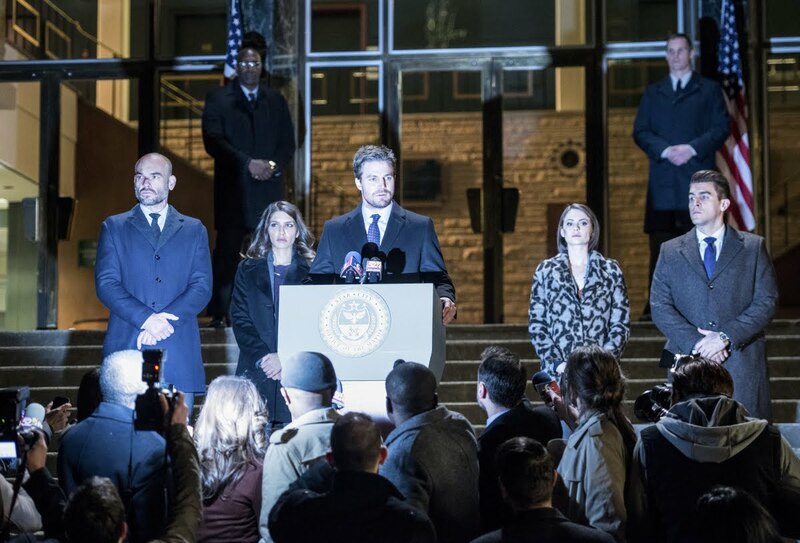 Thea’s subsequent resignation certainly completes the arc they started last episode, but it still feels sudden and removes what had been one of the more interesting elements of Oliver’s time as mayor. He frankly needs her, and without her around one wonders how anything will actually get done in that office. It’s likely all part of Prometheus’ grand plan to break Oliver. Maybe he meant for Thea to walk away out of fear of becoming too much like her mom, and who knows when everyone else will finally be clued in to what’s he up to. We’ll have to wait two more weeks to find out. I like how this episode immediately called out its “balls” joke for being too immature but then kept on telling that same joker over and over again. New theory: There is no Helix. There’s simply that one girl, and she has been Single White Femaling Felicity for years, secretly plotting to replace her on Team Arrow. Related note: Is it weird for Emily Bett Rickards to be acting opposite an actress who is so clearly doing a glorified impression of her? Why redress the Jitters set and pretend it was a nice Star City restaurant? Why not just say Curtis’ husband wanted to meet in Central City because that’s where he’s been staying since the break-up? Related note: Oh, Curtis. It’s adorable you didn’t see those divorce papers coming. Your ex looked so uncomfortable while you were talking that he was either about to break up with you or reveal he’d been used as bait to get you there as a trap set by Prometheus. Why wasn’t Rene around at City Hall? Doesn’t he work for Quentin? You won me over when you said “Capraesque”. But even before, I was completely on Thea’s side. Oliver is so naive and gullible (including about every season’s Big Bad), he needs someone who can play the political game. You’re right about the Nolan Batman parallels. The Arrow executive producers have been open about their Batman envy, although I think they look at istas an homage. But Arrow was sold to the CW as a show based on The Vampire Diaries format with the Oliver/Laurel/Tommy triangle according to casting director David Rappoport. Did you ever see the promo for the first episode? That commercial….oh, that commercial. I’d never actually seen that before. I actually don’t recall ever seeing a single commercial for Arrow before I watched it. I was home sick from work one day, and just sort of randomly (with maybe a little of “AV Club likes it” influence) decided to give Arrow a shot on Hulu, at which point I believe the season was up to episode 8. If I had seen that commercial, though, I may have never given the show a chance because that’s just horrible. What, I wonder, is Katie Cassidy/Laurel thinking when staring lifelessly at us while Amell/Oliver rambles on with his “I’m like Christian Grey but with arrows” nonsense? Is poor Tommy/Colin wondering why he doesn’t get his own smoldering close-up? And where are the three of them heading while walking so fiercely down that lovely hallway? CW promos, man. Gotta love them because they almost always do their actual shows a giant disservice. Vampire Diaries was the same way. So many promos of Elena in weird gothic dresses looking like a heroin addict, i.e., looking nothing like the Elena from the actual show. Fantastic catch on Kullin, btw. I had completely forgot about that, and while I don’t generally surprise when someone goes dark with a joke…damn, look how dark you went with that “Mrs. Kullin committed suicide as a way of getting away from him” joke. I love it. Oliver…I’ve joked before that he’s lucky he’s pretty because he’s just so dumb. But I don’t know that Stephen Amell can really be said to be pretty, not the same way Grant Gustin can or (pick out literally any other CW leading man). Either way, he’s lucky he can brood so well because he’ll need it with all the mistakes he makes, particularly when Thea (or someone like her) is not around to offer a common sense viewpoint. And the Batman thing…maybe I should just ignore all that. We’re 5 seasons in. The Batman Begins comparison is played out by now. However, it’s because we are 5 seasons in that I am actually surprised when they again do something which vaguely recalls The Dark Knight trilogy. Still, I have to really give it to them – having Prometheus just brutally dispose of Vigilante and then turn to reveal he is actually the man we all thought was Vigilante was a very well-executed twist.